Humanity is in crisis. Major governments of the world have combined into two superpowers: The Coalition, and The League. As these two regimes face off in an international staring match, crises spring up around the globe that threaten to spark into catastrophe. On the brink of disaster, key players must try to de-escalate the conflicts that arise. This is the setting for 11:58, the new cooperative/social deduction game from Christopher Ng and 3rd Place Games. They’re also given a hand of voting cards, which can be 1 or 2 power votes for either red or blue. There are also a few neutral cards in the deck. This clock is both timer and victory marker for the game, and it’s going to start to change quickly. The game ends as soon as all of the cards in the clock are one color. If it ends up all blue, then humanity survives. Red: not so much. 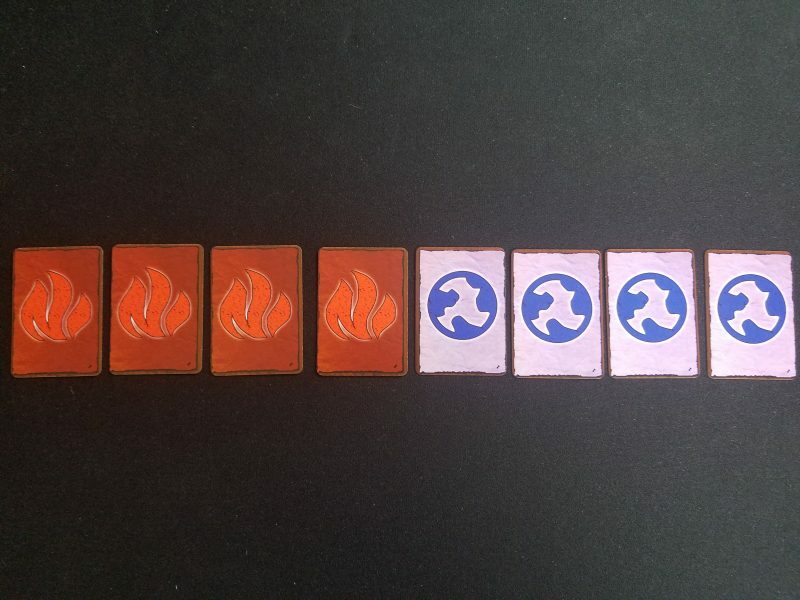 How do the cards move? How does humanity move closer or further from ultimate destruction? Crisis cards. Navigating these crises are the crux of the game. Each round a new one will flip over. Some have one time immediate effects. But most of them will have a situation that must be voted upon by the players. 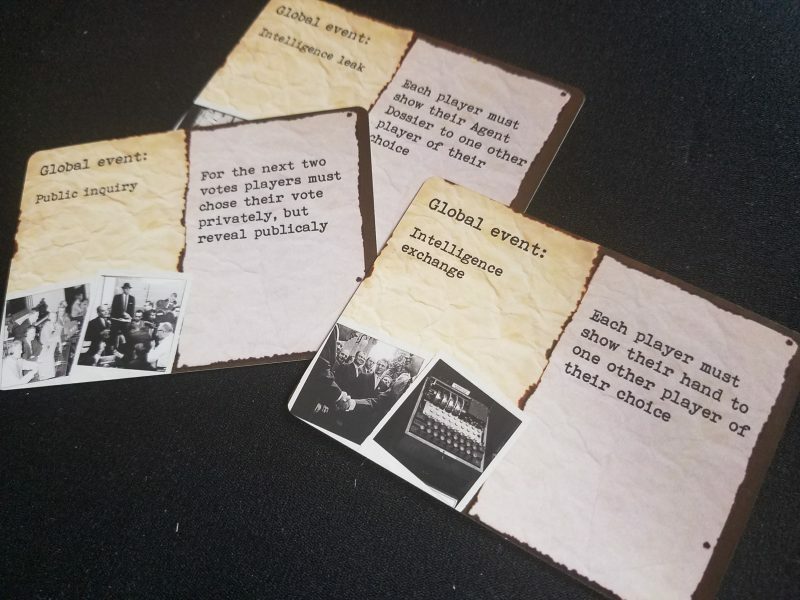 After a period of negotiation, each player plays one voting card from their hand face down, and a random card is added from the top of the draw pile. The cards are shuffled and revealed to see which option passes. If there’s a tie the red option occurs. If you’ve played the Battlestar Galactica game, it’s similar to how that game resolves crises. 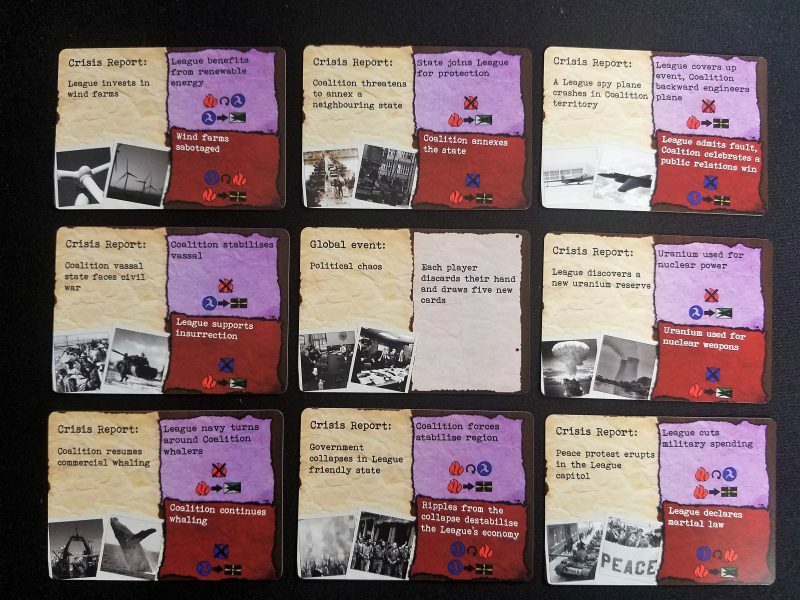 These crisis cards can do a number of different things, but usually they’re going to be affecting the doomsday clock by removing or flipping cards. 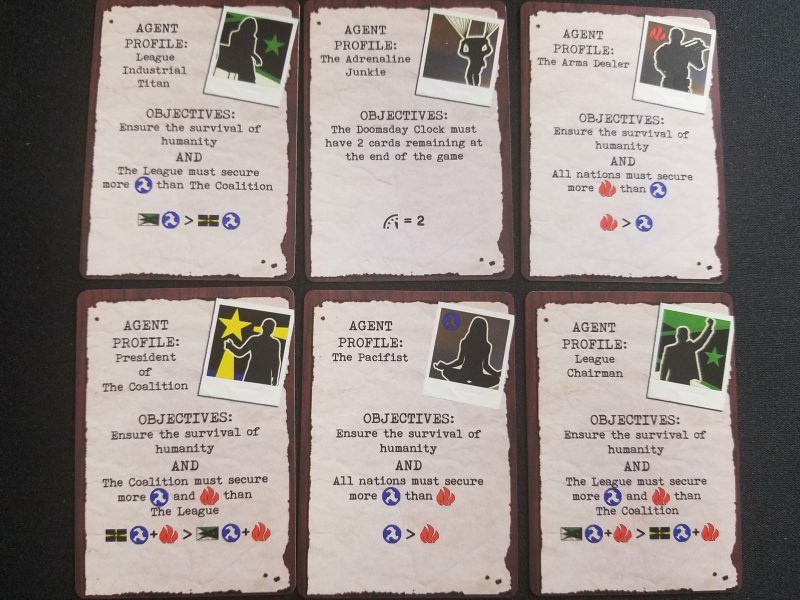 They can also cause cards to accumulate on either the League or Coalition cards, which is super important for many of the secret roles. 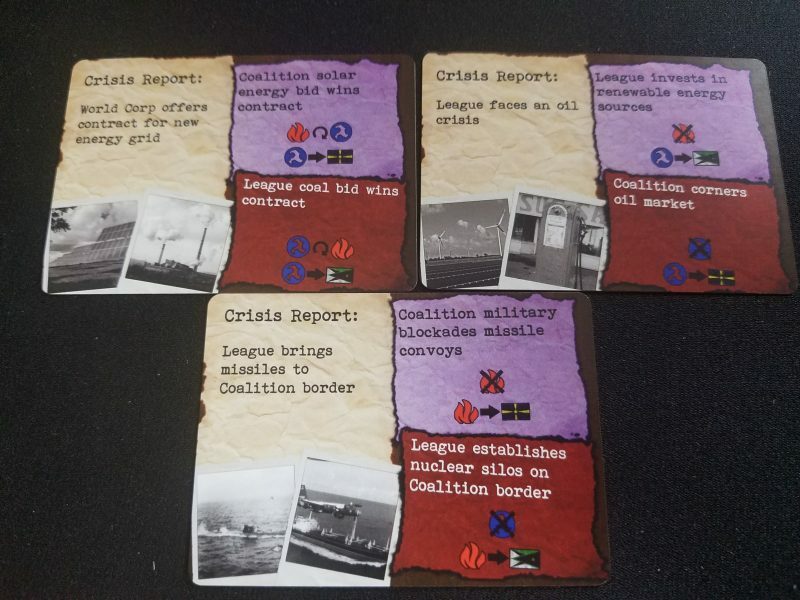 After the crisis is resolved everyone draws another card and a new crisis is revealed. Repeat until the doomsday clock is entirely one color. The main play area set up. But there’s a twist. At player counts from 4-10 there are one or two “harbingers” who are traitors to humanity and will stop at nothing to see it perish. 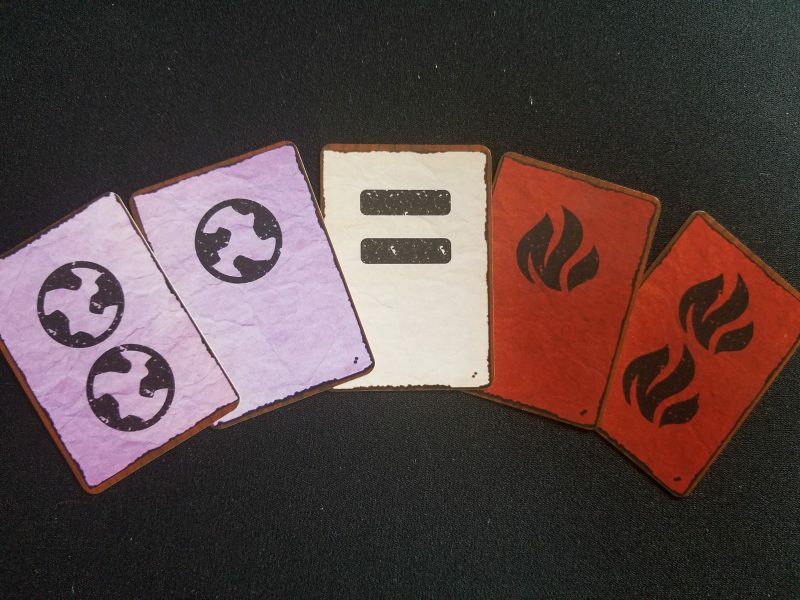 That, combined with the fact that non-harbingers will need to manage their hand of cards well, lest they end up with something closer to a pile of garbage than a hand of useful cards, means that the good guys will need to be careful to negotiate and plan effectively. At the end of the game you simply see if you’ve met your personal win condition based on your loyalty card. 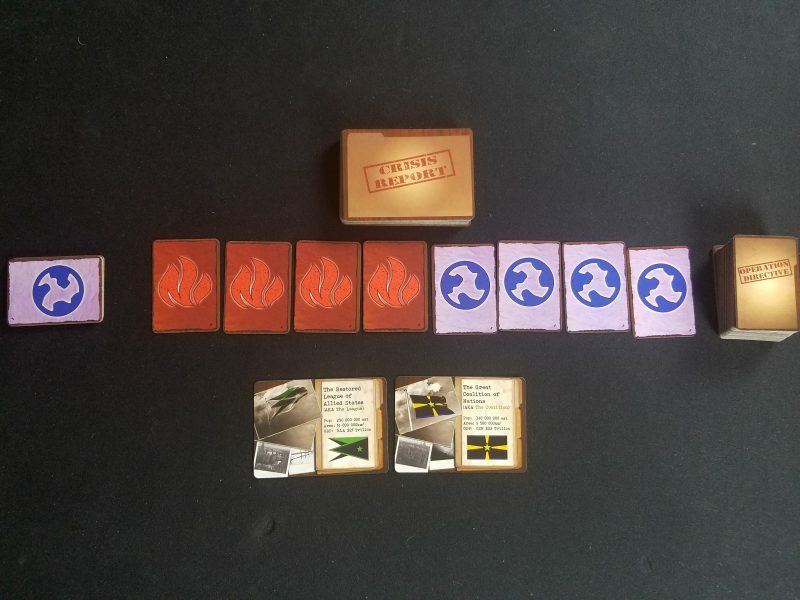 Interested in this backstabbing negotiation game? 11:58 will be on Kickstarter within the next couple of weeks. Follow 3rd Place Games on facebook and/or twitter so you don’t miss the launch!